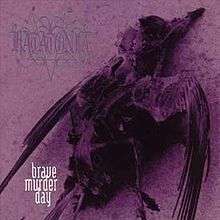 Brave Murder Day is Katatonia's second full-length album, released in 1996 by Avantgarde Music. This album created a new guitar position with Fredrik Norrman's input, and features harsh vocals by Mikael Åkerfeldt of Opeth. It is also the last Katatonia LP to feature any death growls and other death metal elements. The original version of the record was not mastered, but the 2006 Peaceville Records re-release finally released a mastered version of the album and included the Sounds of Decay EP as bonus tracks. The remastered edition also includes new liner notes by Anders Nyström. The previous Century Black reissue of the album included the four tracks from the band's For Funerals to Come EP. A vinyl released was issued through the band's Northern Silence Productions. All lyrics written by Jonas Renkse, all music composed by Katatonia. ^ "Murder" & "Rainroom" are featured on Brave Yester Days. ^ "12" is a re-recorded version of the song Black Erotica from the W.A.R. Compilation Volume 1 (1995). The song can also be found on the 2004 compilation Brave Yester Days. ^ "Endtime" is one of very few Katatonia recordings to utilize samples, featuring a clip of dialogue from the Stanley Kubrick film, The Shining, during the latter half of the song's lengthy intro. ↑ "CoC : Katatonia : Interview : 8/12/2001". 1 2 "KATATONIA Vocalist Talks About Touring North America For First Time". 23 October 2006. ↑ "back.jpg (image)". 1.bp.blogspot.com. Retrieved 2012-02-08.